The CCS811 Air Quality Breakout is a digital gas sensor solution that senses a wide range of Total Volatile Organic Compounds (TVOCs), including equivalent carbon dioxide (eCO2) and metal oxide (MOX) levels. 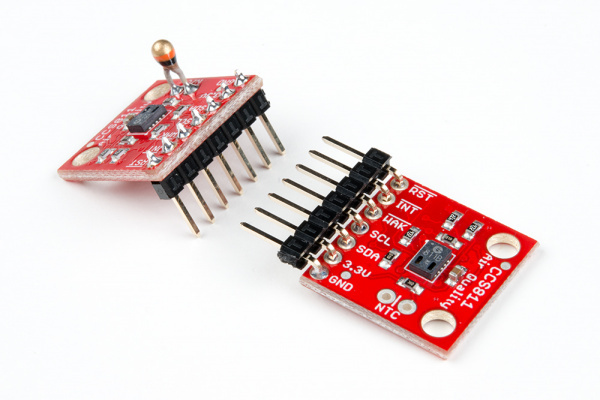 It is intended for indoor air quality monitoring in personal devices such as watches and phones, but we've put it on a breakout board so you can use it as a regular I2C device. The CCS811 is supported by only a few passives, and so the breakout board is relatively simple. This section discusses the various pins on the board. The minimum required connections are power, ground SDA and SCL. 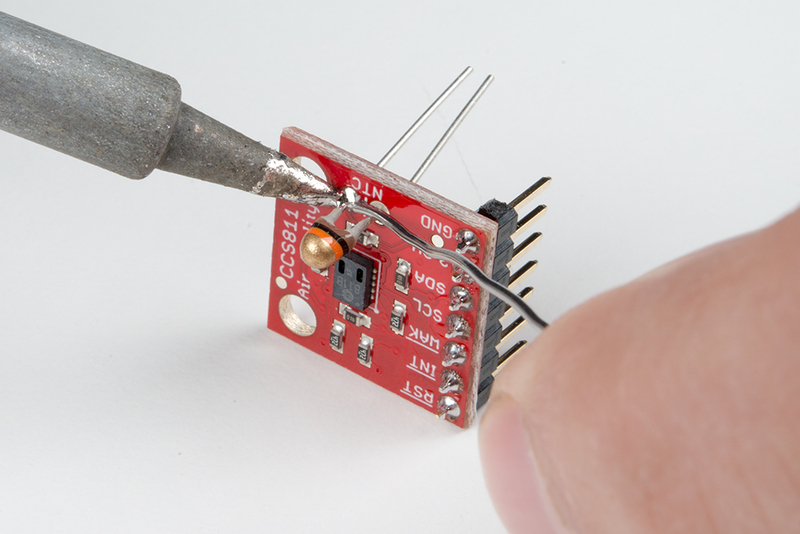 Supply a regulated 3.3V between the board's 3.3V pin and ground terminals. The sensor consumes an average of 12mA of current. The I2C bus has pull-up resistors enabled by default. If not desired, these can be removed by separating the "I2C PU" triple jumper on the bottom side with a hobby knife. An I2C address can be either 0x5A or 0x5B. The "ADDR" jumper is connected with copper from the factory, corresponding to a default address of 0x5B. Separate this jumper to use the address 0x5A. Settling time: This sensor takes about 20 minutes to get fully settled to a point where it generates good data. The I2C bus is active, and data can be collected before the 20 minutes is up, but it may not be accurate. Additionally, the three control lines RST, INT and WAK can be used to further the degree of control. RST --- Pull this line low to reset the IC. INT --- After configuring the sensor to emit interrupt requests, read this line to determine the state of the interrupt. WAK --- Pull this line high to put the sensor to sleep. This can be used to save power but is not necessary if power is not an issue. A thermistor can be used to determine the temperature of the CCS811's surroundings, which can be used to help compensate the readings. You'll need your own 10K NTC thermistor, such as our 10K Thermistor, soldered between the "NTC" pins. A thermistor is a nonpolarized device, so it can go in either way. To prepare the sensor for the examples, attach seven pins from a Break Away Header to the through holes. Even though we only need the four I2C pins, we'll populate all of them for this guide in case we want to try them out. 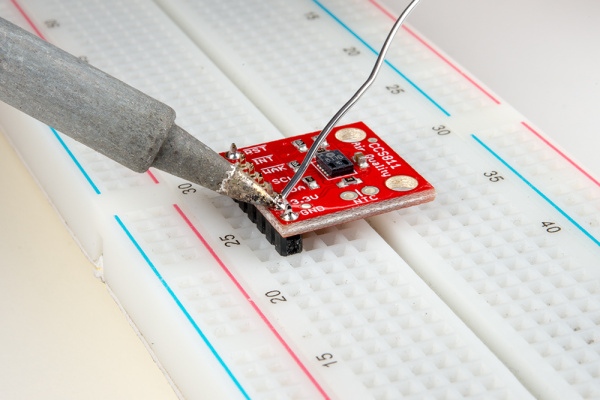 Place the strip of seven pins in a breadboard. Solder a single pin and then check that the board is square to the pins. If you would like to use a thermistor to compensate for temperature, solder in a 10K Thermistor (Vishay part number NTCLE100E3103JB0). You're ready to start communicating with the CCS811! Here's an example with the NTC Thermistor populated, and one using right-angle headers instead. To get the Arduino library, download from GitHub or use the Arduino Library Manager. 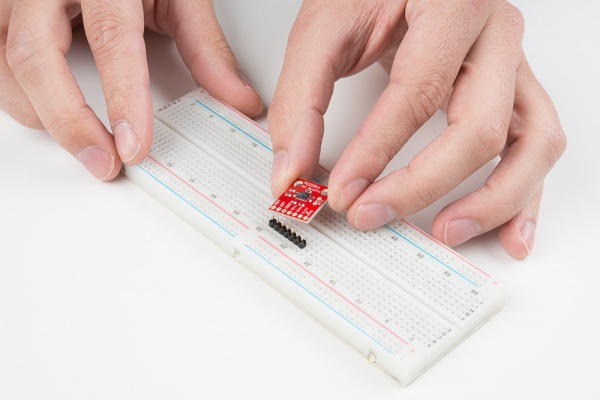 For help installing the library, check out our Installing an Arduino Library tutorial. 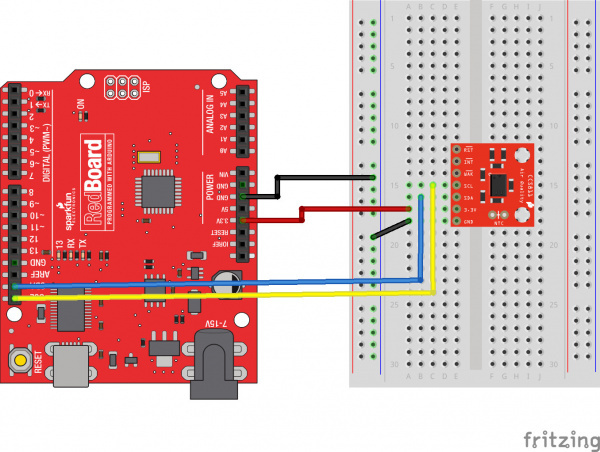 If you don't end up using the manager, you'll need to move the SparkFun_CCS811_Arduino_Library folder into a libraries folder within your Arduino sketchbook. If you downloaded the zip, you can remove "master" from the name, but it's not required. The library is fairly normal to use compared with our other sensors. You'll have to include the library, create a sensor object in the global space, and then use functions of that object to begin and control the sensor. With this one, pass the I2C address to the object during construction. Now, functions of the object named myCCS811 can be called to set up and get data, while all the wire stuff is kept under the hood. To make the sensor get ready during program boot, myCCS811.begin() must be called. Here's an example of the minimal usage of begin. Error Status: The .begin() function has a special feature: it returns the status of the function call! If there was a problem during begin, it will return a non-zero code indicating what happened. It's optional, and is described in the "Custom Types and Literals" section below. Then, in the main loop of the program, call sensor functions such as mySensor.readAlgorithmResults() to operate the sensor. The following snippet shows a simple check for data, to call on the sensor to calculate and get values, and to access those values. It doesn't do anything with the data, though! Check out the examples for fully functional code. The following functions exist for the CCS811 object. Functions with scoped return type CCS811Core::status report an error state as defined in the literals section below. It is optional and can be used to determine success or failure of call. CCS811Core::status begin( void ) --- This starts wire, checks the ID register, checks for valid app data, starts the app, and establishes a drive mode. CCS811Core::status readAlgorithmResults( void ) --- Call to cause the sensor to read its hardware and calculate TVOC and eCO2 levels. bool checkForStatusError( void ) --- Returns true if there is an error pending. This checks the status register. bool dataAvailable( void ) --- Returns true if a new sample is ready and hasn't been read. bool appValid( void ) --- Returns true if there is a valid application within the internal CCS811 memory. uint8_t getErrorRegister( void ) --- Returns the state of the ERROR_ID register. uint16_t getBaseline( void ) --- Returns the baseline value. CCS811Core::status setBaseline( uint16_t ) --- Apply a saved baseline to the CCS811. 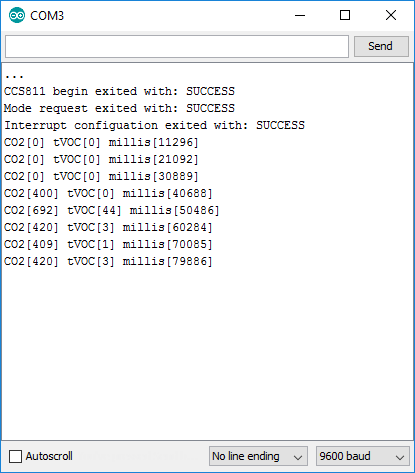 CCS811Core::status enableInterrupts( void ) --- Enables the interrupt pin for data ready. CCS811Core::status disableInterrupts( void ) --- Disables the interrupt pin. CCS811Core::status setDriveMode( uint8_t mode ) --- Sets the drive mode (mode can be 0 through 4). CCS811Core::status setEnvironmentalData( float relativeHumidity, float temperature ) --- Sets the environmental conditions for compensation. void setRefResistance( float ) --- If you've changed the thermistor pull-up, call this to give the sensor the new resistor value. Otherwise, it will be 10000. CCS811Core::status readNTC( void ) --- Cause the CCS811 to get and calculate a temperature from the thermistor input. uint16_t getTVOC( void ) --- Collect the last calculated TVOC value, in parts per billion (ppb). uint16_t getCO2( void ) --- Collect the last calculated eC02 value, in parts per million (ppm). float getResistance( void ) --- Collect the last calculated resistance value of the NTC terminals. float getTemperature( void ) --- Collect the last calculated temperature. To avoid the possibility of multiple libraries using the same status name, the enum is actually inside the scope of the CCS811 object, buried in the CCS811Core, which is the base class. Phew, don't worry about that too much; just place CCSCore:: before the status name when you want to use it, and use it like a regular enum (e.g., CCS811Core::status myLocalReturnStatus;). This just tells the compiler that the variable name is in a specific place. You'll also have to add the scope operator to the enum names. The library also defines names for CCS811 registers, if you're using direct read and write functions. These are globally scoped and can be used anywhere. After you've got pins attached to your breakout board, the first example to use should be BasicReadings. Select it from examples or copy from below. Connect the sensor as follows as a starting place for the examples. Wiring diagram showing basic connection to RedBoard. Click for a closer look. For this example, only 3.3V, GND, SDA and SCL are needed. The jumpers on the board are left in the default positions. runs at the default 1 sample per second. 20 minutes of run in before readings are considered good. This code is released under the [MIT License](http://opensource.org/licenses/MIT). 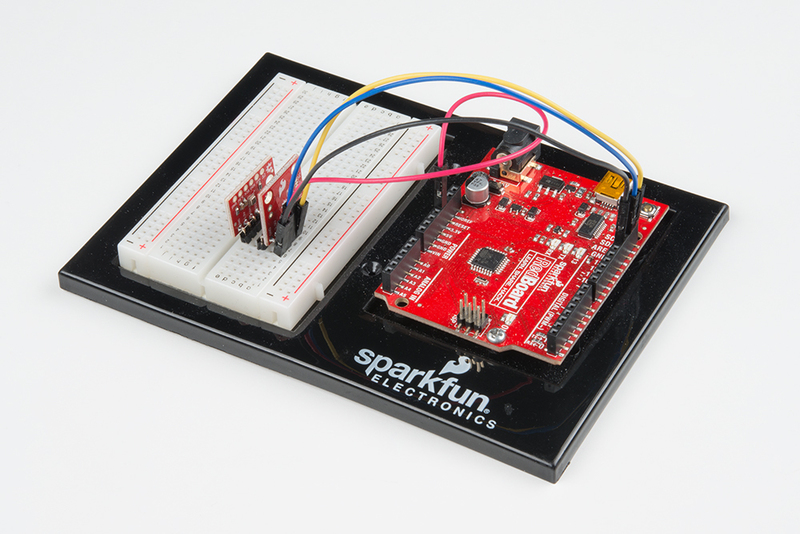 or concerns with licensing, please contact techsupport@sparkfun.com. while (1); //Hang if there was a problem. //If so, have the sensor read and calculate the results. At the beginning, an object is created in the global space CCS811 mySensor(CCS811_ADDR); and is constructed with the address as a parameter. During the setup phase, the library is told to configure with CCS811Core::status returnCode = mySensor.begin(); Using the return parameter to check for errors is optional, and in this example if the return code is not valid, the program enters a captive while loop. 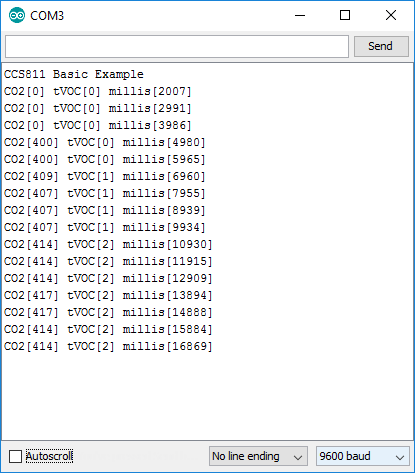 To get data from the sensor, mySensor.dataAvailable() is checked until a new reading is ready, mySensor.readAlgorithmResults(); is called to have the sensor process the reading, then mySensor.getCO2() and mySensor.getTVOC() are used to retrieve the calculated values for gas levels. If everything is connected correctly, the serial window will report gas levels every second. Remember the sensor takes 20 minutes to properly warm up, so values reported will rise up in the early stages of operation! The CCS811 has a couple extra control lines that are not part of the I2C bus, which can be utilized to improve the system. There's a pin to flag that data is ready, and a pin to make the sensor go to sleep. Wiring diagram including the wake and interrupt pins. Click for a closer look. To connect the interrupt line, connect it directly to an input pin. This is a 3.3V output from the sensor, so it's OK to drive the input logic of a 5V device from it. The example has nInt connected to pin 6. To connect the wake stat line, use a voltage divider to divide the 5V coming from the Arduino down to something below 3.3V for the sensor. The example has nWake connected to pin 5 through a voltage divider made from two 4.7K resistors for a 2.5V output. This example configures the nWAKE and nINT pins. //This sets the mode to 60 second reads, and prints returned error status. //type of error to the serial terminal. //to this function to see what the output was. //saved within the error register. Notice that this example doesn't poll dataAvailable() to check if data is ready; instead it reads the state of a digital input. When the input is low, data is ready in the sensor and readAlgorithmResults(), then .getCO2() and getTVOC() are used as normal. The WAK pin can be used to control the logic engine on the CCS811 to save a bit of power. When the WAK pin is low (or disconnected), the I2C bus will respond to commands, but when the pin is high it will not. Tens of microseconds are required to wake or sleep, so in this example, commands are wrapped with a 1ms delay. The terminal displays the calculation every 10 seconds. You can see that it take a few samples for the algorithm to spit out data, even at a slow rate of acquisition. Between the sampling, power is decreased as much as possible. To have the CCS811 compensate for pressure and temperature conditions, obtain those metrics and pass to the sensor object with setEnvironmentalData. This guide only shows the example that uses randomized data, as it can be used without additional components yet still illustrate the effects of different climates. status_t setEnvironmentalData( float relativeHumidity, float temperature ) --- Sets the environmental conditions for compensation. A starting place for working with the compensation is the setEnvironmentalReadings example. After the same configuration from the basic example, this sketch applies a random temperature and humidity, then takes 10 reads and repeats. 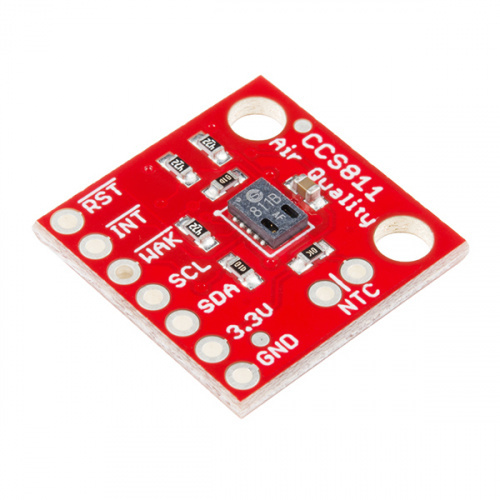 Generates random temperature and humidity data, and uses it to compensate the CCS811. This just demonstrates how the algorithm responds to various compensation points. Use NTCCompensated or BME280Compensated for real-world examples. //If the CCS811 found an internal error, print it. If you have a BME280 sensor, they work great for getting the compensation parameters. Use the example BME280Compensated to see compensation using another sensor. Connecting the two devices is as simple as putting them on the bus together. View BME280Compensated.ino on github, or use the example from Arduino. Alternately, an NTC resistor can be placed in the provide PTH terminals, and the example PTHCompensated can be used to see how the internal ADC is used to calibrate for temperature only. There is one caveat to this method: no humidity data! Partially compensated is better than uncompensated, so punch in an average humidity for your area, or leave the example's default at 50 percent. View NTCCompensated.ino on github, or use the example from Arduino. SparkFun_CCS811_Arduino_Library Repository --- Source and example files for the Arduino library used in this tutorial. Also, the following examples are included with the library but not discussed. They may help you on your way! A top hat decked out with LED strips makes for a heck of a wedding gift. 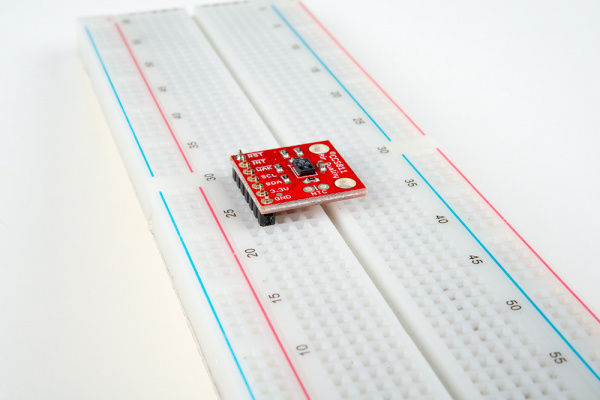 Or maybe check out our tests using the sensor at SparkFun!